Which is ironic, since Jesus wasn't any of those things. Anyways, I am still in awe of awe. I still feel invited by creation to observe and praise that which is ordinary and extraordinay. I thought I'd share my Christmas sermon right here, right now. I hope this Easter weekend you run into love from your family and friends, good food, some chocolate, and Mystery. Preached 12/31/17 at Trinity United Methodis in Beaver Dam, WI. The story of the birth of Jesus was written 60-90 years after his death – and the point of telling it is different for Matthew and Luke - since they are writing to different groups of people. So depending on who we are - and also sometimes simply who we are this year – different parts of the Nativity Story will move in us in different ways. A small child sees the baby who needs to be picked up and loved. Young parents see Mary and Joseph and recognize the love one feels when a new baby arrives - and no matter how miraculous – how tired you get taking care of that baby. Maybe this year we were the shepherds working the night shift, or the wise men i.e. people working on their educations, realizing how much further they are going to have to travel on their camel before they get to graduation…. We who are older now might identify with Anna and Simeon looking around for signs of God’s love and presence in deeply troubled times. Through-out the gospel Nativity story there are so many interesting characters and settings - angels, shepherds, people traveling from afar. The long, dusty road Mary and Joseph traveled to Bethlehem. A crowded and unwelcoming village. A dark sky spangled with stars from one horizon to the other. One star shining brighter than anyone expected to see - marking an opening in the universe that would set what’s ordinary akimbo, that would realign the universe; that shines even now for those of us who long to witness God among us. One innocent day last spring (if a day can be innocent) my husband asked me if I would like to take a little getaway to Chester, Illinois, In August. Because we all know how appealing southern Illinois is, in August. I have been married to him for a very long time. I trust him, but I do not always understand him. Right. Getting a little old for kids, aren’t we? Sounds interesting. I’ve seen a few partial eclipses in my life. If you set up a safe method of watching them, you can see fingernail-shaped shadows in a bucket of water. Kind of cool. 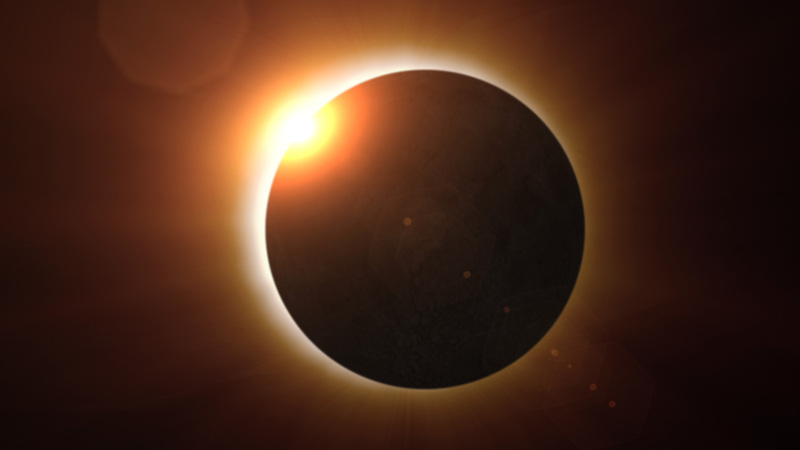 The eclipse would be Monday, August 21st, at 1:20. We left home the Saturday morning before that Monday. Expecting massive traffic driving towards the Path of Totality, we noted the traffic wasn’t too remarkable. We arrived at our motel by evening, went out to eat, took a hike around Cahokia – pre-Columbian city that is a World Heritage site -- located next to the racetrack in Collinsville, IL. The next day was Sunday; we drove south to check out the Chester Visitor Center where Len had bought tickets so that we could view from there. We did some other sight-seeing– the Mississippi River area around there had been settled by Europeans as early as the late 1600’s – Fort de Chartes is a French fort, parts of it still standing now were built in 1720. If you read the Outlander books or watch the TV series - this was approximately the year Jamie was born! We needed to be ready to see the eclipse early afternoon on Monday which meant I saw a rare sight at quarter to 6 that morning. My husband was up, dressed and packing our bags! He does not usually do anything before coffee. We arrived at Chester’s Welcome Center at 9. Cool. Only 4 hours and 20 minutes until Totality – and we weren’t even the first people there! We set up our chairs, put on sunscreen, sun hats, and sunglasses. We looked at our phones – the place had Wi-Fi. People kept arriving, we chatted with some of them. We watched airplanes flying into a small airport across the river; rich people arriving for the eclipse. Trains rumbled past; boats and barges cruised up and down the Mississippi. Traffic zipped on the bridge next to where we were. I was getting a headache from the sun and heat and I was also getting a little bored. Not sure if I ever wanted to sit on a deck for 4 hours looking at transportation systems. By noon the temperature was close to 100 degrees – and since it was southern Illinois – it was so humid you could just about squeeze out the air. We admired the wooden sun viewer gizmo someone had set up close to us. One aimed its dinner plate-sized lens at the sun; that then made a shadow on the white surface under the lens so you could watch the outline of the sun. Every few minutes someone had to readjust it; the sun moves that fast. A wonderfully nerdy-looking high school kid had a big sun-viewing telescope that people were taking turns looking into. We talked to a 70-ish woman who was a wedding photographer from Chicago who said photographing the sky was her passion; weddings were just her bread and butter. She had several cameras, lots of lenses, plus a notebook with a hand-written choreography of the order of cameras, lens, and apertures she was going to utilize during the few minutes the eclipse was actually going on. Len and I looked like slouches next to many of those folks – we only had viewing glasses as well as dark filters that fit over our binoculars. Did I mention how hot it was? We were getting to that point where you don’t talk; you just sit quietly and breathe, channeling your inner salamander. And then, maybe about ten to 1, there began to be a buzz in the 200 people milling around on the deck, lawn, and parking lot. I looked at the sun-viewing contraption next to me. Wow! You could see a serious bite out of the sun! There wasn’t any difference in the world around us, but that sun viewing contraption showed what was going on so I kept checking it – and the bite was growing. I was surprised that even with more than half the sun blocked; you could barely see any difference in the amount of light around us. If I hadn’t known we were in eclipse, I would not have realized it. Part of me was skeptical. THIS is the eclipse? A vague graying of light? And then, friends, at around 10 after 1 – there was a moment where we went from normal to a noticeable dimming … and it was happening fast. The sun that had been blazing for 4 hours was losing its grip on the sky. The world went quiet. Wind picked up the way it does at dusk and the temperature dropped; I felt a cool breeze on my arms and neck. Birds stopped chittering in the trees. I heard the abrupt and unexpected buzz of cicadas. I don’t know when I stood up - but now I was standing and so was everyone else – and we became quiet as the light of the day around us just disappeared. Suddenly there was a horizon of blue clouds - totally around us. And then it happened. The moon slid completely in front of the sun. Vapor lights in the parking lot came on. People – all of us who had become silent together – began to cheer. Tears leaked from my eyes as I turned to Len who was also moist-eyed. He shoved the binoculars in my hand. I looked up through the lenses - and there was no sun; just a black hole surrounded by a ring of fire which is sun’s corona – leaping and exploding firestorm flames that, scientists tell us, are hundreds of miles tall. They are always there but we never see them because we mortals can’t look at the sun. I stared at the sun that was not there, and at the world around me, for my allotted two minutes. And then, surprising me, I saw tiny burst of pure white-blue light at the edge of the sun. They call it the diamond ring, because for a few seconds that’s what you see, the golden corona with a bump of brilliant white light as the moon is now phasing across the sun. The sun is so powerful that even a tiny, tiny fraction of its light removes complete darkness. Within one moment the totality was ended. But then there was another moment I hadn’t even known to expect. When the available light from our sun is still just that diamond of glittering light – our world is otherworldly. Light was intensely blue white and there is a silvery sheen over everything. And then, ordinary was back. Like I say that all took less than three minutes. The tears on my cheeks were still damp. I looked around at the people around me; everyone seemed as dazed and dazzled as I felt. No one had enough words for what we had witnessed with our eyes, our hearing, and our skin. The book of Matthew says the shepherds saw a star, and then they heard angels singing, and then they didn’t know what to do so they went to town to tell others what they had seen and heard. Kind of like I just did. How did the gospel story of the birth, life, death, and resurrection of Christ begin? Something happened. Something happened HERE! The thing that happened – happened right here in our eyes, in our heart, while we were together with people we do and don’t know. We traveled to see an event, but didn’t even know in the traveling how powerful that event would be. We were living our lives when something broke into our consciousness and made us gasp and feel frightened and joyful and amazed all at the same time. It only lasted a little while, but that moment will, in ways we can’t quite explain, change us from here on out. That moment that we witnessed is part of who we are now. Something happened. The experience of it was bigger than these words talking about it later – but words are all we have now, so we are sharing them. Something moved in us, and then it moved outwards into the lives of others. Our Luke passage is the ending of the traditional nativity story and it only shows up this way in Luke. 2:22-40. I have cut out about half of it; you can read it later if you are interested. Mary and Joseph take baby Jesus to the temple. Simeon and Anna, old people now, longing for God to be revealed – felt the presence of God when this little child, son of humble people, was presented to them. The world had had no room for this baby to even be born in - he would be born in a stable - yet here, our disciples and writers are telling us decades later – here is the beginning story of our savior who would have room in his heart for all of humanity - and for us. In the beginning, we don’t know exactly who this child is; we don’t know why things are happening. We just know something happened here. Those few moments of eclipse were over. Time to drive the 400 miles back to Waukesha - about 6 hours, more or less. We got in our car, rolled down the windows, boy there was a lot of traffic. Well, that was to be expected, Chester is a little town, it would take a while for the traffic to clear out to the highways. At 10:00 that night, EIGHT hours since we had pulled out of Visitor Center – we stopped at a rest area still south of Rockford, IL. We’d been traveling, bumper-to-bumper at 35 mph for 8 hrs. We were not even to Wisconsin yet. There was a line out of the women’s restroom with about 50 women in it. I got in the line. And then I started to smile. 50 human women who have all been in cars with husbands and children for 8 hours. That line was chatty! We needed each other. There were the comments on how others had tried to get out of the traffic, there was discussion of roads and strategies and apps that were supposed to help but didn’t. Someone had her phone out – we could see the terrific traffic jams happening across the United States following major highways north and south out of that path of totality. The country was as striped as a zebra. We were - all 50 of us women - amazingly mortal. Complaining, enduring, laughing. And also still a bit dazed. The end of a story tells you what the beginning meant. Jesus the baby, the child, the man would teach a message that would light the world. Think of the sermon on the mountain – blessed are those who are unimportant, poor, and grieving, who are refugees, who are hurting and lost –- because, Jesus will tell us - they are the children of God. They are the point of God’s story, just as God’s Love is the point of ours. When we cherish and help, give to and love those around us who need cherishing, help, love, and support – that is how we worship our Christ, our God. And now we know what happened here. There was light. There was a hole in the universe where we could see that the story is big, and we are part of it, and we are here to worship the baby born right here, where something happened. I remember reading this the first time around. I was tearing up (again) as the crowd was cheering. The Baby Jesus , with all of his humanness and holiness. Happy Easter, Girlfriend! Thanks. It was an amazing moment. totally explainable and yet so sacred. The way those kinds of moments are.